Last night’s game looked lost for the Orioles. I was listening to the game on my way to western Pennsylvania and it seemed liked they were headed to a loss against the Minnesota Twins. Jason Hammel – who started the game – was off; the Orioles were mired in a six-run deficit and shutout in the first six innings, plus the offense seemed to be non-existent. However, business started to pick up for Baltimore in the final two-thirds of the game. The offense woke in the latter third of the contest and they scored three runs in both the sixth and seventh innings to tie things at six; then, in the tenth inning, the Orioles plated in three runs and decided the game once and for all. The bullpen – T.J. McFarland, Tommy Hunter and Jim Johnson – pitched six innings of relief and helped Baltimore earn their 22nd win of the season. They have won seven out of their last eight series and are doing their best to keep up pace with the New York Yankees and Red Sox. The offense pounded out eighteen hits last night and every batter – except Matt Wieters – had a hit. Manny Machado, Adam Jones and Chris Davis each had three hits; meanwhile, Mick Markakis, Nate McLouth, Alexi Casilla and Chris Dickerson each had two.hits. 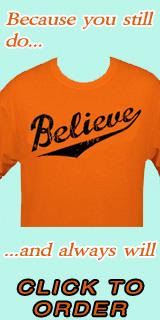 The league knows now that the Orioles will play every out in the game and not give up. That is what winning franchises do and the Orioles are for real. They are maturing and becoming a force in the American League. The Birds have moved far away from the losing culture of the past and are now expected to compete.